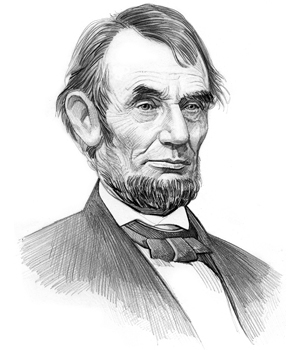 Abraham Lincoln was the 16th American President who served in office from March 4, 1861 to April 15, 1865. The events of the American Civil War dominated his presidency. The American Civil War was fought between the Union and the Confederacy from April 12, 1861 – May 10, 1865. The bitter, bloody conflict of the Civil War, in which brother fought brother, was fought over a time period of 4 years, 3 weeks and 6 days. Over 10,000 separate conflicts were fought, mostly small, forgotten skirmishes, that have been eclipsed in history by the horrific battles fought at Bull Run, Antietam, Vicksburg, Shiloh, Chickamauga, Fort Donelson and Gettysburg. It is estimated that the American Civil War resulted in the deaths of 618,222 men, 360,222 from the North and 258,000 from the South with an additional 500,000 casualties. This website details the major events of the American Civil War. The Civil War Sitemap provides access to all the articles from the causes of the conflict, the attempts to reach a compromise to avoid secession of the Southern States, the establishment of the Confederate States of America, the weapons and the uniforms, the battlefields, the military strategies and the terrible battles fought during the American Civil War. An ideal educational resource for kids, schools, college and homework projects. The following links provide access to interesting information and an overview of each individual year of the Civil War. Discover facts about the major political events and the military progress of both the Union and Confederate armies and the battlefields that they fought on. A short history of the Civil War in just five pages! An ideal overview of the history of the Civil War for kids, students, schools and homework. There were many Causes of the Civil War, in fact we have listed no less than 38 contributing factors to the causes of the Civil War! The causes of the Civil War are presented in a comprehensive list with access to detailed articles for those searching for additional facts and information. Our Civil War Timeline provides a month by month, year by year chronicle of all of the key dates of important political events and military clashes of the Civil War. It is estimated that 2.75 million soldiers fought in the American Civil War. Two million from the Northern states and 750,000 from the Southern states. Facts and information about the military strategy of enforcing the Union Blockade. Extremely helpful overview of key dates for kids, students, schools and homework. The Confederacy consisted of eleven southern states that seceded (withdrew) from the Union to form their own country in 1860 and 1861 before, or just after, the inauguration of President Abraham Lincoln on March 4, 1861 and the start of the Civil War. The southern states that formed Confederate States of America (in order of secession) were South Carolina, Mississippi, Florida, Alabama, Georgia, Louisiana, Texas, Virginia, Arkansas, North Carolina and Tennessee. Four border states from the Upper South then seceded from the Union and were also admitted to the Confederacy (Virginia, Arkansas, North Carolina and Tennessee). The Confederate States of America later accepted 2 additional states (Missouri and Kentucky), although neither of these states officially declared secession nor were they ever controlled by Confederate forces during the Civil War. The article on Civil War Inventions and Technology will bring some surprises. The American Civil War was revolutionized by the many inventions made possible by advances in technology that were prompted by the desperate need of new weapons and new advancements in military warfare. submarine, torpedoes, ironclads, mines, landmines, rifles and artillery. Communications between the battlefields were enhanced by telegraph and signaling systems. The transportation of troops and equipment was transformed by the railroad. 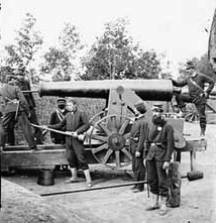 Examples of Civil War Inventions and technology featured include weaponry, artillery, transportation, communications and medical advances. Discover facts and information about the Ironclads: Monitor vs Merrimac and the amazing history of the Confederate Submarine. Discover interesting facts and info about the Civil War weapons, war machines and technology that were used by soldiers on the battlefields, and at sea. 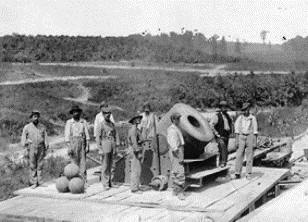 A 13 inch mortar used during the Siege of Petersburg, Virginia. The combatants of the American Civil War were the southern states who joined the Confederate States of America (CSA), also referred to the Confederacy or simply "The South" and the Union (USA) referred to as "The North". The term "Yankee" was the most common nickname for people from the North as well as Union soldiers in the Civil War, other nicknames included Billy Yanks, Jayhawkers, Blue-bellies, Yanks, Bummers and Federals. The soldiers of the South, the Confederacy (CSA), were called by nicknames such as Johnny Rebs, Butternuts, Grays, Rebels, Rebs, Graybacks, Dixie and Secesh (short for secessionist). Some of the nicknames referred to the Civil War uniforms worn by the soldiers. Confederate troops wore troops wore gray or butternut uniforms (they used nutshells to make the dye) - refer to Confederate Soldiers Uniforms. Whereas Union soldiers wore blue uniforms - refer to Union Soldiers Uniforms. Guerrilla fighters of the Confederate army were called Bushwackers. The Mason-Dixon Line was the boundary line that split the free states of the North from the slave states of the South in the Civil War. The Mason-Dixon Line went between Pennsylvania to the north and Virginia, Maryland, and Delaware to the south. The word 'Dixie' was used to designate the South in the United States. There are many interesting facts and Civil War Statistics, especially relating to the casualties of war. And what about the Financial Cost of the Civil War? Do you know how many rounds per minute a Gatling gun could fire or how much it cost to capture Jefferson Davis? Both of these articles are full of interesting stats and facts about the Civil War. A massive number of troops on both sides were taken as prisoners during the American Civil War. An estimated number of some 214,000 Confederate soldiers were imprisoned in the North in the Civil War, during which time 26,000 of them died. Approximately 211,000 Union soldiers were captured and imprisoned in the South in the Civil War, during which time approximately 30,000 of them died. Andersonville Prison, Georgia and Libby Prison, at Richmond, Virginia were two of the Confederate military prisons for Union Army soldiers in the Civil War. Camp Chase, Ohio and Rock Island Prison, Illinois were two of the Union prisons for Confederate soldiers in the Civil War. There were few places available initially to hold captive prisoners and exchange system was used. The exchange system of the Civil War disintegrated in 1863 because the Confederacy refused to treat black prisoners the same as white prisoners. The best Generals of the war were General Robert E. Lee for the Confederacy and General Ulysses S. Grant for the Union. General Robert E. Lee claimed famous victories at Fredericksburg and Chancellorsville for the South and bravely defended a perimeter around Petersburg and Richmond. General Ulysses S. Grant was the strong, brilliant adversary of General Robert E. Lee. General Grant led Union victories including the battles of Fort Donelson, Fort Henry, Shiloh, Vicksburg and Spotsylvania. The Civil War Battles Timeline provides provides the dates and results of the major conflicts fought by soldiers of the Confederacy and the Union during the Civil War. Many of the soldiers, on both sides, died from disease because of the unsanitary conditions of the army camps. It is interesting to note that by the end of the Civil War, there were approximately 180,000 Black Troops fighting in the conflict, about 10% of the Union army of which some 38,000 lost their lives. Check for facts and information about the Civil War battlefields via the Civil War Battlefields by State article. Our history of the American Civil War provides a short history of the major Civil War Battles including the Battle of Gettysburg, the Attack on Fort Sumter, the Battle of Bull Run and the infamous Battle of Antietam. For more in depth articles we have provided details of the following battles and battlefields. For additional information about military Strategy of the Union refer to details of the Anaconda Plan. Battle of Antietam The Battle of Antietam was the bloodiest single day battle in American history. Battle of Fredericksburg Nearly 17,000 men would die on that dreadful day. Battle of Vicksburg The Civil War Siege of Vicksburg was fought between May 18-July 4, 1863. Battle of Atlanta General Hood was forced to abandon Atlanta to save his army. Battle of the Wilderness The two opposing armies met in a dense forest known as the Wilderness. Battle of Corinth The Battle of Corinth was fought October 3–4, 1862, in Corinth, Mississippi. Battle of Perryville The culmination of the 1862 Kentucky Campaign. The Surrender at Appomattox on April 9, 1865 heralded the start of the end of the American Civil War when General Robert E. Lee surrendered to Union General Ulysses S. Grant at Appomattox, Virginia. The Assassination of Abraham Lincoln was committed by James Wilkes Booth on April 14, 1865 at at Ford’s Theatre in Washington, D.C. President Lincoln died the next day and was pronounced dead at 7:22 a.m. on April 15, 1865. The article on the Civil War provides an overview of the conflict that divided the nation. The following Abraham Lincoln video will give you additional important facts and dates about the political events experienced by the 16th American President whose presidency spanned from March 4, 1861 to April 15, 1865. Refer to the following for additional facts about the political history and Presidency of Abraham Lincoln during the Civil War Era.